‘The Big Sick’, written by Kamail Nanjiani and Emily V. Gordon, depicts a cinematic version of the story of their courtship (the two are now happily married). Kamail, played by himself, is a part-time Uber driver and part-time hopeful comedian, who spends his evenings gigging with his friends in the hopes of making it big (or at least, getting noticed). One evening he finds himself in a conversation with Emily (Zoe Kazan), and the two go back to his afterwards. What was supposed to be just a one-night stand develops quickly into a full-blown relationship, but for Kamail this is a cause for concern as it gets in the way of the traditional Muslim arranged marriage he is supposed to agree to. The pair have a massive bust-up after Emily finds out about this secret that Kamail is hiding from her, and it looks like it’s all over for the two. That is, of course, until Emily is induced into a coma after an unknown infection develops, and Kamail finds himself by her bedside, along with Emily’s parents (Ray Romano as Terry and Holly Hunter as Beth) who aren’t particularly pleased to find him there. I rarely watch romantic comedies – there’s a few classics that I love, such as ‘Love Actually’ and ‘Notting Hill’, but generally I’m not all that into them because they just feel too similar. There’s only so many plots that you can keep rehashing within the genre, and I find they just get too predictable. Despite ‘The Big Sick’ being a rom-com, I can honestly say that it felt very original. It’s more than a rom-com, really – yes, the relationship between Kamail and Emily is a big focus, but there’s also a lot within the story looking at culture, honesty, and expectations. It’s really a ‘finding oneself’ type of movie, as we perceive Kamail going along with his religion without much effort (playing video games instead of praying, for example) in an effort to please his strict parents Sharmeen (Zenobia Shroff) and Azmat (Anupam Kher). Every family dinner sees a young single Pakistani woman brought into the gathering, yet it’s clear that the idea of arranged marriage is something that Kamail is not buying into. There’s a lot of cross-cultural themes within the film and they’re highly relevant right now, as the plot really explores cultural traditions and Western lifestyles and what the balance should be between the two. It’s a powerful message – despite key differences between cultures, these cultures can coexist quite happily. It also manages to avoid pointless cultural stereotypes, which only works in the film’s favour. The cast are all brilliant, but I found Romano and Hunter particularly excellent as Emily’s chalk-and-cheese concerned parents. Their relationship with Kamail and how it grows is the real relationship focus in this story, and it’s dealt with tenderness and subtlety that helps keep the whole thing feeling authentic. It’s also nice to watch a comedy that’s not all about the comedy (despite being about a comedian); there’s loads of laughs but there’s also lots of emotions flying around. Nanjiani and Gordon have achieved what so many others fail to do, which is strike exactly the right balance between comedy and drama, meaning you’ll be laughing as you watch, but crying at points too. I’m definitely excited to see more from the pair. 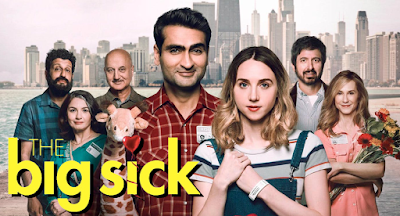 ‘The Big Sick’ is a light watch with a serious message, executed so well that it’s quite hard to fault anything with it. Even if you’re not overly into this type of film I urge you to give it a go – it might just surprise you.